Surrounded by freeways and bombarded with billboards, we green-seeking Angelenos take pride in our nature-ish things. East L.A. has Evergreen Cemetery; West L.A. has Venice Beach; Silver Lake has its reservoir. Or had, anyway. I didn’t read further–I freely admit to not caring about the Drama of the Reservoir–because “Evergreen Cemetery” stopped me cold. Evergreen Cemetery? I’m one of the rare Angelenos who is aware of what is east of Downtown, but I had never heard of Evergreen Cemetery. Turns out it is the cemetery I have often photographed when I’m stuck in traffic. But come on, surely there are a lot of green spaces over here in east Los Angeles that are a lot more interesting than a cemetery. In the year that I’ve lived in El Sereno, I’ve been supremely impressed by my local parks and what they offer. With the exception of one park, the 6 LA city parks within a 5 minute drive of my house all boast basketball courts, tennis courts, running trails and sometimes two playgrounds. 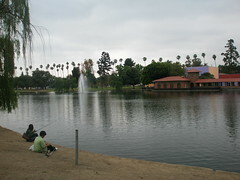 2 of these parks have public swimming pools (your LA Public Library card gets you in for free), one is open year round. All of them are immensely more fun that staring at a watery pit surrounded by chain link fencing. When I’m feeling “nature-ish” I usually take the kids to Ernest Debs. You can climb the hilltop and enjoy the view of the skyline and Dodger stadium. Then, you can take the trails and go up to the lake at the very top of the hill. From up there you can see Highland Park, Mt. Washington, parts of Eagle Rock and Pasadena. If you drop down the trails on the north, you wind up at the Audubon Society where you can check out their completely green and environmentally sound property. Still feeling rubbery in the legs from Sunday’s race, we took the kids to Lincoln Park. It’s like the Echo Park of the east side, but less smelly and lotus-y. The few times I’ve been to Lincoln Park have been on runs. Today was a meandering day, so I got a chance to really check out everything. The park boasts a skate park, an ginormous pool, two baseball fields, basketball courts, gymnastic equipment, tennis courts, a lake, a carousel, covered picnic tables, two playgrounds, a recreation and Plaza de la Raza. There is also public art surrounded by a drought-tolerant garden and easily 1.5M gopher holes. While there are signs of decay and neglect; a crumbling parking lot and walls, weeds on the grass, lights missing their heads, on the whole the park is integral to the community. There were people fishing on the lake, the Lincoln High School softball team playing and children being taught music at Plaza de la Raza. I did wind up reading the rest of the Op-Ed. I learned that the author is looking for her own bit of Lincoln Park in the middle of Silver Lake. I only wish her luck on that endeavor. Glad to hear you are discovering the joys of the Eastside! :) Evergreen Cemetery has a popular jogging track around the perimeter. The city (along with local activists) actually pulled up the concrete pavement and put in a rubberized sidewalk so people’s knees won’t get damaged when they run. 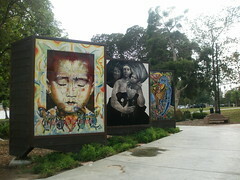 Also, the public art in Lincoln Park is part of Las Memorias, an AIDS memorial. Across the road is El Parque de Mexico, the largest grouping of outdoor statuary in Los Angeles, donated by the Mexican government. The statue of Emiliano Zapata is usually graced with a festival and march every year. An Aztec dance festival is held for Cuatemoc, near his statue, across from Zapata. Lincoln Heights and Lincoln Park has a long history of being home to civic and Chicano activities, festivals, protests etc. I love the LH site. I’ve learned so much from that site.